The 2017 Ram 1500 is an attractive full-size, light-duty truck that is available in multiple trim level, body style and engine options, and with a plethora of premium features. In this 2017 Ram 1500 Big Horn vs Sport comparison, we are going to look at two midrange trims on this excellent pickup. These models slot in between the Tradesman and Express base trims and the elite Laramie, Laramie Longhorn, and Limited models. Both of these trims are available in regular cab, Quad Cab or Crew Cab body styles, and with front-wheel or all-wheel drive. Other attractive feature standard on both models includes a rearview camera, a 10-way powered driver's seat and the responsive Uconnect infotainment system with an 8.4-inch touchscreen display. We have more details below. 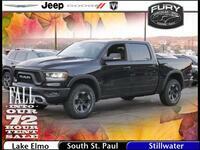 If you are interested in learning more about any trims of the 2017 Ram 1500 in the Twin Cities area, contact a member of the Fury Motors South St. Paul sales team or explore our new inventory today. 6'4", 8', 5'7" Available Box Lengths 6'4", 5'7"
While both the Big Horn and Sport trim of the 2017 Ram 1500 come with an eight-speed automatic transmission, there is some difference between their engine options. The 2017 Ram 1500 Big Horn comes standard with a 3.6-liter gasoline V-6. This engine is standard for the 2017 Ram 1500 and is rated for 305 horsepower and 269 pound-feet of torque. The Sport comes standard with the 5.7-liter V-8 engine which cranks out 395 horsepower and 410 pound-feet of torque. While this engine offers premium power, it is the only option on the Sport model. In this 2017 Ram 1500 Big Horn vs Sport comparison, the Big Horn is the only trim also available with a diesel option (rated for 240 horsepower and 420 pound-feet of torque). In this 2017 Ram 1500 Big Horn vs Sport comparison, both trucks offer attractive features. The Sport offers body-color exterior trim, LED taillights and accent lighting, projector-style headlights, and advanced driver information display, and an extra USB port charging station. The Big Horn comes standard with remote start (which is not a standard feature on the Sport model). Features that make their first appearance on the Big Horn, but carry over to the 2017 Ram 1500 Sport trim include upgraded cloth seating, a 10-way powered driver's seat with lumbar support, dual-zone automatic climate control, and a leather-wrapped steering wheel. Other attractive features may be available on this models. Contact a member of our team or explore our inventory for more details!